2016 is just around the corner, but what will be the biggest jewellery trend of the new year? 2016 is just around the corner and I'm sure you're all wondering, what is the biggest jewellery trend for 2016? Well, wonder no more as we at Diamond Heaven have the answer. Rose gold is a composition of 75% gold and 25% copper, which gives the metal it's charming, gorgeous rose hue. An absolutely gorgeous metal, from our observations of the market, rose gold is going to be the most popular metal of choice for jewellery in the next year. The first mention of rose gold came from 19th century Russia, where Russian jewellers experimented in blending gold with copper, which resulted in this new coloured gold with a bright red hue. It was referred to as red gold or Russian gold but its popularity wasn't limited to Russia. Throughout Victorian Britain, rose gold was a sought after metal for jewellery, especially engagement rings. Over the years, rose gold jewellery has been coming in and out of fashion. In 2016, it will be back and it's easy to see why. It's rich, rose hue is absolutely stunning, a remarkable colour and a wonderful metal to work with. 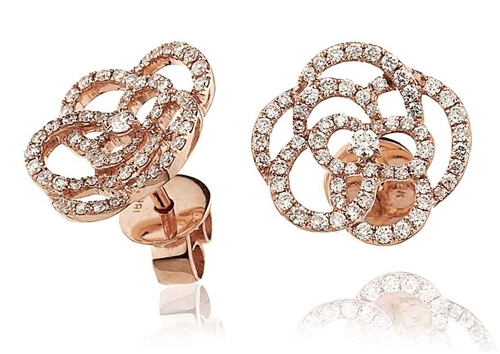 Here are three of our most popular rose gold pieces, which you'll find breathtaking. Check out this pair of modern designer earrings with trails of tiny, flawless round diamonds. 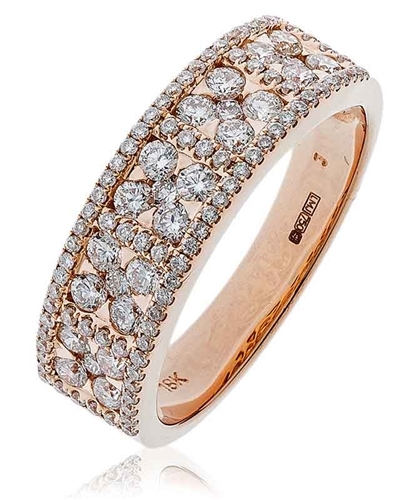 This piece is utterly heavenly, the rose gold's rich pink tone works with the diamonds and really help them shine brighter. A piece more unique than the traditional stud earring, these floral shaped earrings are truly stunning. This pave set designer pendant with round diamonds is a gorgeous piece. Delicate and divine, this pendant is an absolutely breathtaking combination of flawless diamonds and a beautiful rose gold in this chic, stylish design. And finally, there is this half diamond eternity/dress ring with round diamonds. This gorgeous piece would make the perfect gift, not only for Christmas, but for anniversaries too. The unique, delicate design allows you appreciate the quality and the sparkle of the diamonds in this unusual setting. We're ahead of the trend with our range of 18ct Rose Gold Jewellery. View our Rose Gold Engagement Rings, Pendants, plus Earrings and more online.